This is a new item. This is NOT made by American Girl can be used by the 18 dolls. 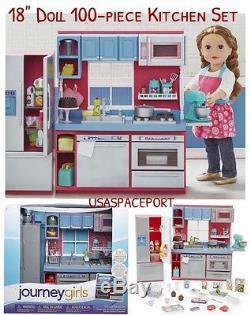 Kids can make pretend meals with the Doll Kitchen Set with Large Refrigerator. The stove door and refrigerator open and close. It also features a microwave, sink and a side counter with a chair for dining. The play kitchen set encourages imaginative or modeled play in a child-size package. This colorful set offers a full range of realistic looking cooking additions to help your homemaker whip up easy meals for his or her family. The kids' kitchen set contains many pieces to simulate a real feel. It can give you child meal preparation options. The wipe-free surface keeps it clean. 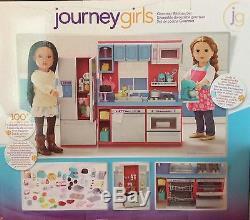 With sturdy construction and many functional details, the Girls Gourmet Kitchen Set is a dream come true for your doll. A pretend stove, oven, sink, dishwasher, and fridge will have aspiring chefs whipping up culinary masterpieces in no time! The Girls Gourmet Kitchen Set Features. Includes over 100 pieces of food, appliances, cookware, utensils and accessories. Realistic full kitchen has everything your Girl needs to cook up some fun. Compatible with most 18 inch dolls. Works with any 18 doll like American Girl, Madame Alexander, New Journey Girls, Our Generation and more! Great for a toddler preschool room or montessori classroom, even an office. THIS MAKES A GREAT GIFT. If an item is damaged or missing pieces, it will be exchanged or replaced for the same item. The item "100-piece 18 Doll KITCHEN +Refrigerator Set Food Dishes for American Girl Boy" is in sale since Wednesday, June 14, 2017. This item is in the category "Dolls & Bears\Dolls\By Brand, Company, Character\American Girl\Furniture". The seller is "usaspaceport" and is located in Cocoa, Florida. This item can be shipped to United States.